It�s never too early to begin your Christmas shopping! This hand tied halter would make the perfect addition to your tack collection. Each halter is hand braided from a lariat rope by the Cameron�s lifelong friend. The halter is adjustable to fit a variety of head sizes and shapes. 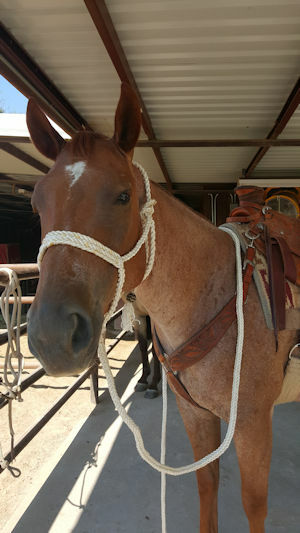 Each halter has a connected lead rope that is roughly 10 feet long. The ends of the halter and lead are decorated with a rawhide knot. A portion of each sale will go to benefit the Cameron�s lifelong friend. Please call for color choices as available rope colors vary.